This tasty Mexican Quinoa salad is bursting with flavor and so easy to make! 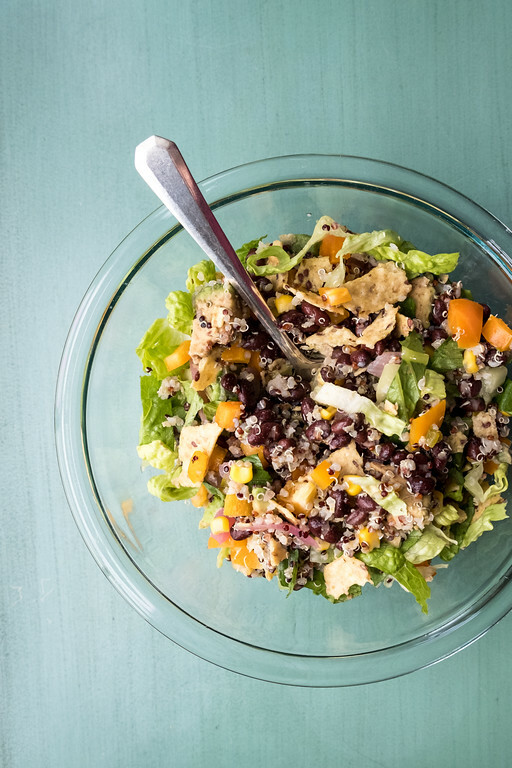 Quinoa, black beans, corn, red onion, bell pepper, pickled jalapeño peppers, avocado, romaine lettuce, tortilla chips and limes combine to make this healthy and delicious quinoa salad! It’s vegan, gluten free and perfect for a meatless lunch or dinner! 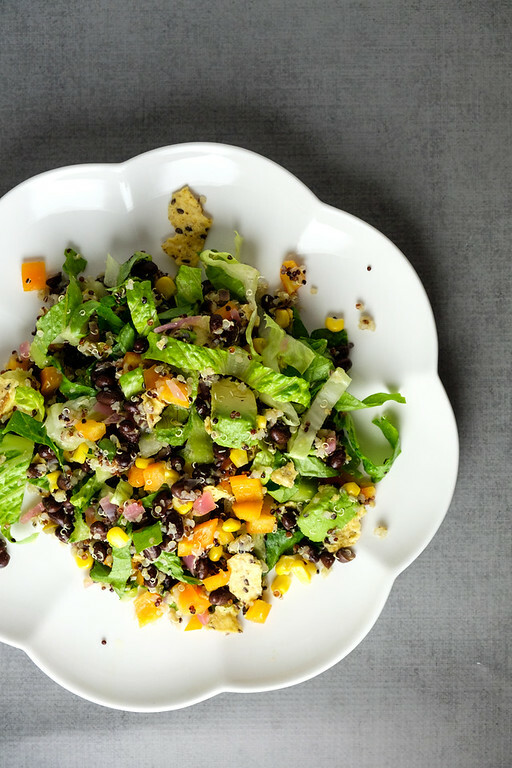 Click here to pin this Mexican Quinoa Salad now! What do you turn to when you need a quick and healthy dinner? For me it’s some sort of vegetable bowl or salad. It’s such an easy way to get in your vegetables, fruit and whole grains. Speaking of whole grains, did you you know that quinoa is not a grain. It’s actually a seed from a plant that is part of the spinach and beet family! Crazy, right? Even so, we prepare it like a grain and tend to treat it like a grain. I love to use it any where that I might use brown rice, wheat berries or any other grains. I even like it for a healthy breakfast. This salad from Grains as Mains hits all the right notes! This meatless salad is vegan and gluten free and is loaded with good for you things! It provides protein, fiber, flavonoids, healthy monounsaturated fats, vitamins and minerals! So much, I can’t even list it all! The best part…it’s super easy and it tastes great! Quinoa – be sure and rinse it first to remove the natural coating which may taste soapy or bitter. Black Beans – can use kidney beans. Corn – fresh or frozen. Red Onion – I used Quick Pickled Red Onions because I don’t like raw onions. Red Bell Pepper – preferably organic since bell peppers are on the dirty dozen list. Romaine Lettuce – can also use kale for more nutrition value or iceberg lettuce. Step 1 – prepare the quinoa by rinsing draining it. Bring quinoa and water to a boil, then simmer, covered for 15 minutes. Drain off any excess water and let cool. Step 4 – finely dice the red onion, red bell pepper and pickled jalapeño peppers and add to bowl – toss to combine. Step 5 – Peel, pit and cut avocado into cubes and add to bowl and toss gently. Step 6 – Shred the lettuce and add to bowl. Step 7 – Crumble tortilla chips and add to bowl. NOTE – if you want to serve this later or pack it for lunch do not add the tortilla chips at this time. Add them at serving. Step 8 – Serve with fresh lime wedges. I do want to mention that this salad has no dressing. All of the ingredients lend some moisture and it honestly didn’t need it. We just did a generous squirt of fresh lime juice and it was perfect. The lack of dressing meant that it kept well in the fridge (especially if you add the tortilla chips to the plate and not the bowl) and was perfect for lunch the next day. 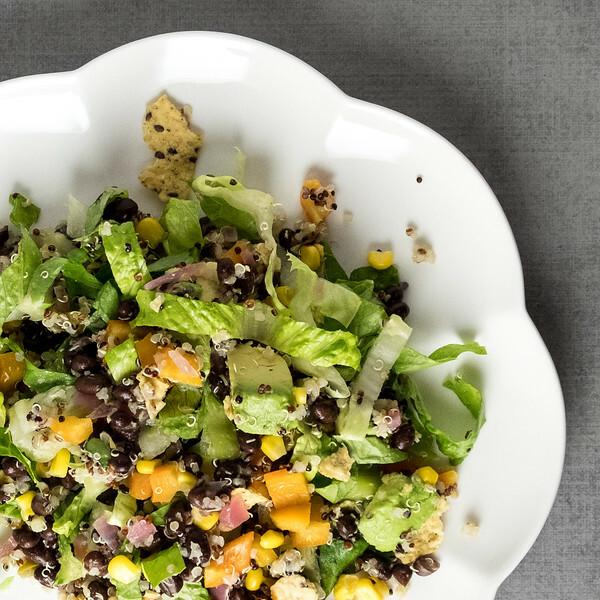 This Mexican Quinoa Salad is filled with all sorts of good for you things - like black beans, orange bell peppers, quinoa and avocados. Rinse and drain the quinoa. Add 1 cup of water to a lidded saucepan and add the quinoa. Bring to a boil. Reduce the heat to a simmer, cover and cook for 15 minutes, or until most of the liquid has been absorbed and the quinoa is fluffy. Remove from the heat and drain off any excess water and set aside to cool. In a large bowl combine the quinoa, beans, corn, onion, peppers, and jalapenos. Mix until combined and then lightly stir in the avocado. Shred the lettuce and add it to bowl, sprinkle with the tortilla chips and toss lightly. Serve with more tortilla chips and fresh lime wedges to squeeze over the salad. Quinoa - be sure and rinse it first to remove the natural coating which may taste soapy or bitter. Black Beans - can use kidney beans. Corn - fresh or frozen. Red Onion - I used Quick Pickled Red Onions because I don't like raw onions. Red Bell Pepper - preferably organic since bell peppers are on the dirty dozen list. Romaine Lettuce - can also use kale for more nutrition value or iceberg lettuce. Note - if you want to serve this salad later or pack it for a lunch - keep the tortilla chips separate until serving. Your post is featured on Full Plate Thursday this week, and will be pinned to our Features Board. Thanks so much for sharing it with us and enjoy your new Red Plate! I love the Mexican Flavors for this delicious Salad! Thanks so much for sharing your awesome post with us at Full Plate Thursday. Have a great week and come back soon! I am loving the sound of this! I am a big fan of quinoa (and everything else in this salad) so I’ll have to make it soon! These flavors in this quinoa salad are so refreshing. I am still exploring quinoa and amazing at the possibilities it has. I love quinoa salad and always make it a little different every time. Really like you Mexican twist on this – looks and sounds delicious! What a vibrant looking salad. I love how corn livens up a salad! I absolutely love quinoa, and this is a fab recipe. Have you ever cooked quinoa in broth instead of water? It’s the best thing ever. So so tasty!